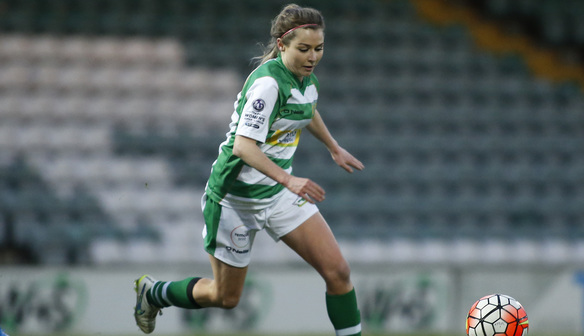 Sarah Wiltshire felt patience was the key to Yeovil Town triumphing in their top of the table clash with Durham. After a goalless first half the deadlock was broken shortly before the hour through Atlanta Primus. Wiltshire made the result certain for the FA Women's Super League 2 leaders, leaving Durham six points behind Yeovil. “We changed the formation slightly in the second half so that might have worked in our favour, but we just kept patient and our chances came,” said Wiltshire. “We did well. We were much better in the second half and we're happy to get another three points on the board. “Durham are a very good team, they made it difficult for us. But we made sure that in the second half we played our game and we took our chances and scored both goals. Yeovil came close after just four minutes. Ellis Hillman picked the ball up after a defensive scramble from Durham, and her right foot shot was palmed away by goalkeeper Helen Alderson. At the other end Charlotte Haynes was relatively untested until Rachel Lee unleashed a thunderous drive from 30 yards, on the half hour forcing the Yeovil stopper to turn the ball behind. After a quiet first half, the second 45 minutes began brightly, with Yeovil’s Hannah Short volleying just wide after Chloe Macek failed to clear. On 57 minutes Yeovil took the lead when forward Primus beat the offside trap and tucked the ball neatly past Alderson into the bottom-left corner. Ten minutes later, Primus was again played clean through with only Alderson to beat, but this time the home keeper got down to her left to turn the ball around the post. Yeovil doubled their advantage on 73 minutes, with a long ball finding Wiltshire in the box, and she lobbed Alderson for her ninth goal of the season. Durham’s best chance came four minutes later, when Sarah McFadden made a powerful run down the right, only to shoot over the crossbar. “We’re really disappointed because we felt like we had control of the game especially in the first half,” said Durham defender Sarah Wilson. “We created all the chances and we let ourselves down by not being as clinical as we should have been in front of goal. “It was competitive to say the least from the start. Both teams battled. “They created some chances, so did we. “They’ve got some fantastic, experienced players who are great to play against. Durham (4-3-3): Helen Alderson; Ellie Christon, Sarah Wilson, Rebecca Salicki, Chloe Macek; Beth Hepple, Rachel Lee, Sarah McFadden; Tyler Dodds, Natalie Gutteridge, Jordan Atkinson. Substitutes not used: Courtney Corrie, Megan Elliott. Yeovil (4-1-2-3): Charlotte Haynes; Nicola Cousins, Hannah Short, Helen Bleazard, Kelly Snook; Lauren Townsend; Ellie Curson, Ann-Marie Heatherson; Ellis Hillman, Atlanta Primus, Sarah Wiltshire. Substitutes: Stephanie Williams for Primus 72, Emily Donovan for Townsend 80, Natasha Knapman for Wiltshire. Substitutes not used: Charlotte Johnson, Nadia Lawrence.